A collection of 150 hymns, contemporary as well as traditional, especially chosen and designed in a large print format. 'Music plays an important part in all people's lives and in their memories. May these hymns help people to keep their faith and give them strength, hope and joy as they praise the God who loves them and who journeys with them each step of the way.' 150 hymns - selected carefully by an ecumenical group of chaplains, in consultation with other chaplains and residents from retirement villages.Index of first lines and music sources, and index for the Church's year and by themes. Text of the Lord's Prayer, Apostles' Creed, a shortened Holy Communion Order of Service and other blessings. 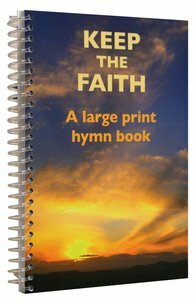 About "Keep the Faith Hymn Book (Large Print)"